In the beginning of July I attended a wonderful concert in Tehran by the Austro-Iranian Symphony orchestra. It was a tribute concert in honor of the Iranian artist and sculptor Parvis Tanavoli, inspired by his “Lions of Iran” exhibition at the Tehran Museum of Contemporary Art. There were three pieces composed by three Iranian composers, Christophe Rezai, Mazyar Younesi and Peyman Yazdanian. Through their music we went on a journey to the source of Tanavoli’s inspiration, the lions. I felt the music took me not only in the footsteps of the lions of Iran which are no more but awoke memories of the lions of Africa, which I encountered many years ago. It is wonderful how music can touch you on so many different levels. I was inspired and after that, I felt the urge to see the exhibition and find out more about the artist who created it. And I’m so glad I did. Born in 1937 Tanavoli studied sculpture in Iran and Italy. 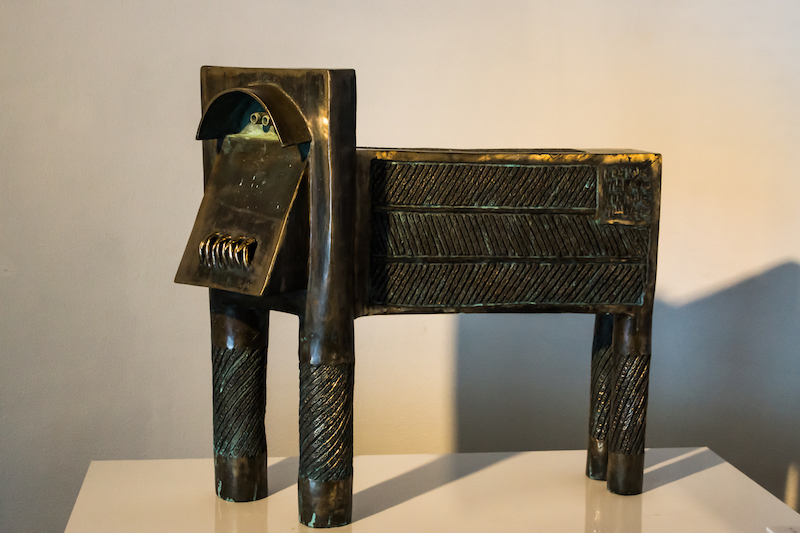 In 1963 he became head of the sculpture department at the University of Tehran where he taught for 18 years. Since 1989 he has lived and worked between Tehran and Vancouver. His works are part of collections of museums all over the world, like the Tate Gallery and the British Museum in London, the MOMA and the Met in New York, the Museum of Modern Art in Vienna, museums in Qatar and Jordan, just to name a few. 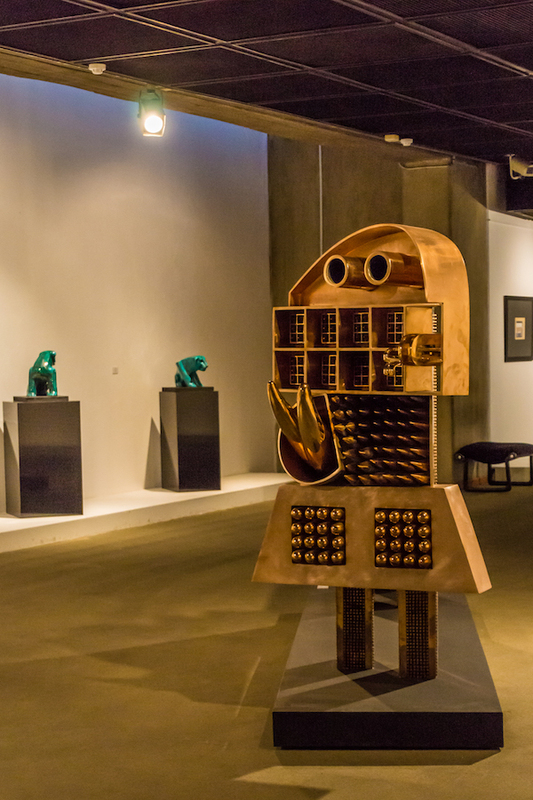 And of course in Iran, the Museum of Contemporary Art in Tehran and the University of Shiraz hold collections of his work. 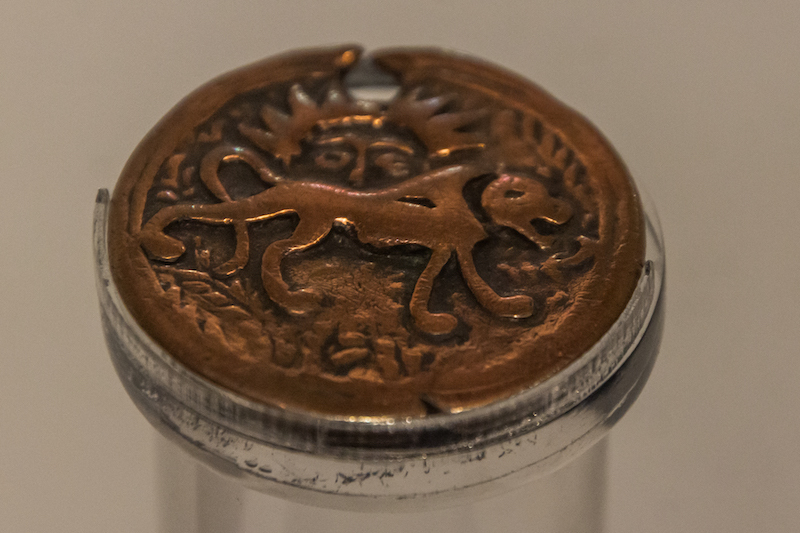 Being a Leo myself, I was very interested by the perspective of presenting the lion as a symbol in Iranian art for the past 5000 years. 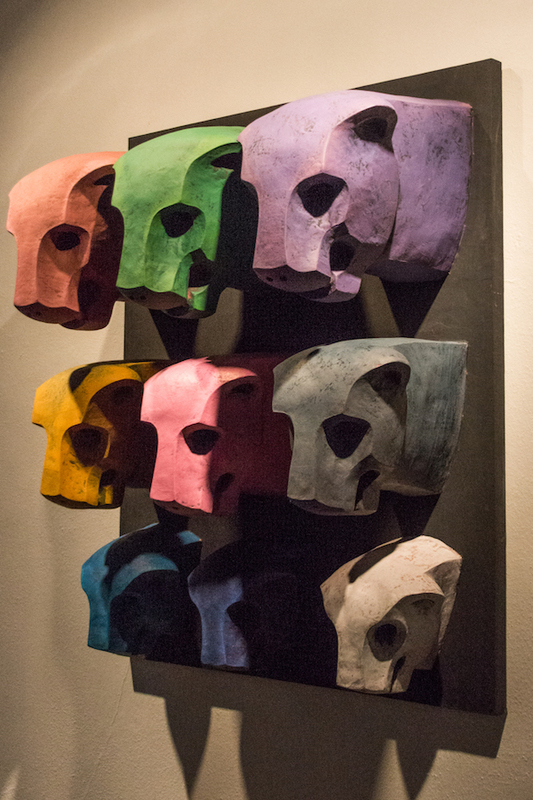 The exhibition comprises around 150 pieces created by Parvis Tanavoli. 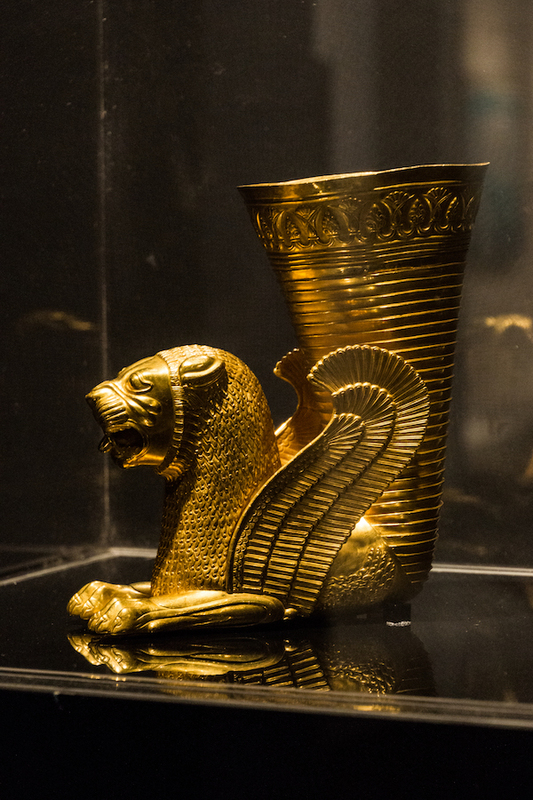 Also his private collection and ancient artifacts lent by the National Museum of Ancient Art and the Reza Abbasi Museum in Tehran. 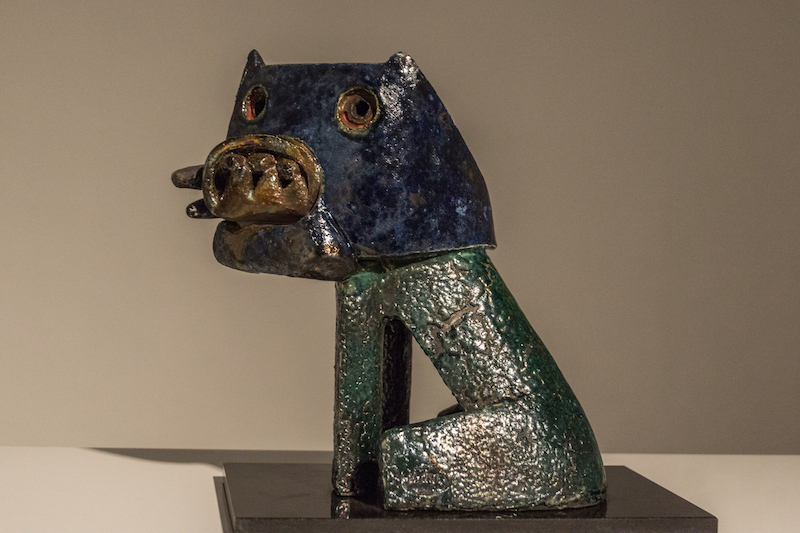 Parvis Tanavoli has called his “Lions of Iran” the most successful exhibition of his career and it is easy to see why. It took several years to conceive, prepare and it wasn’t easy. There were political and logistical problems at times but all were overcome. Parvis Tanavoli’s abilities not only as artist but also as organizer, curator and negotiator were essential for the success of such a great endeavor. The green light came shortly after President Rouhani won his second presidential term. Almost a 1000 invited guests came to the inauguration, including some high profile international art experts and curators. At some point the doors had to be closed as there were too many people interested in seeing the exhibition. 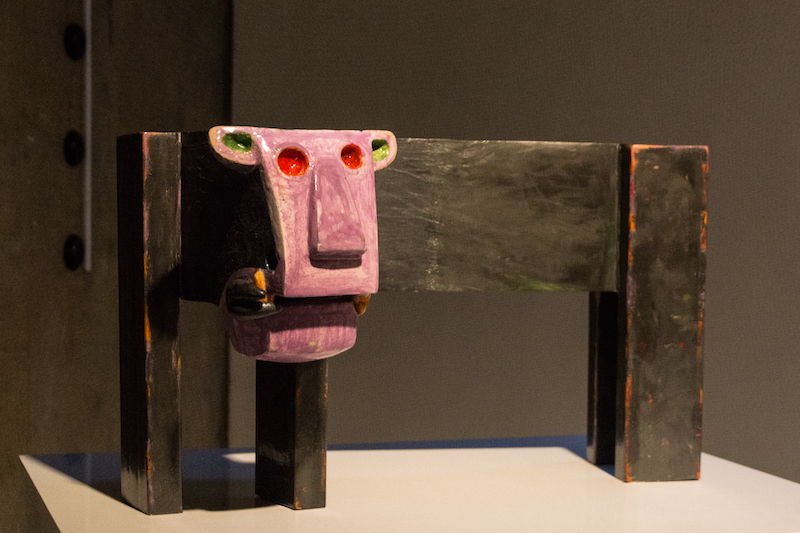 The exhibition starts with Tanavoli’s explanation on how his fascination with lions started. 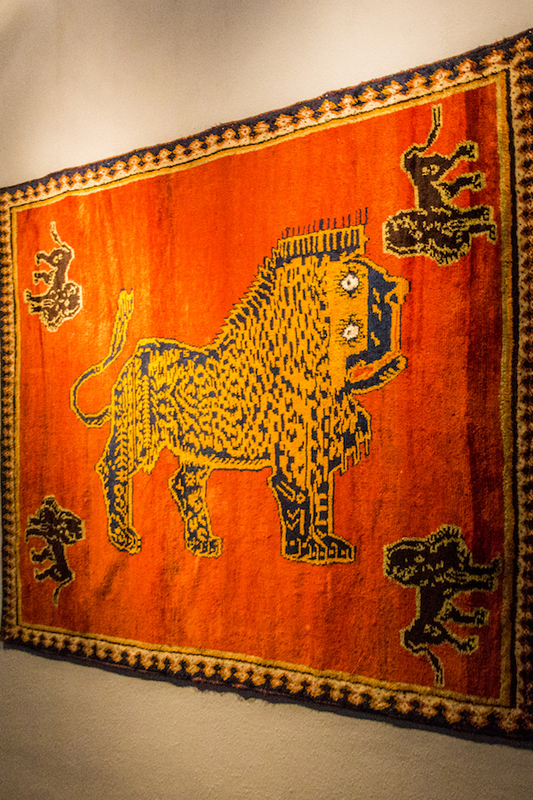 It was in 1968, when he discovered a beautiful lion rug in Shiraz and purchased it. 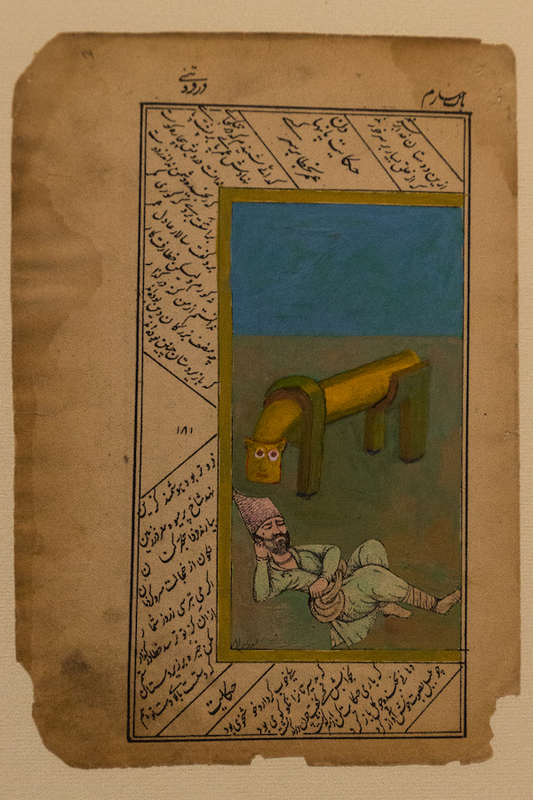 This first one led to further discoveries in the bazars of other cities in Iran. He became a collector. And after he met the Qashquai, a group of five highland tribes who live in Southern and Central Iran, he started a close collaboration. 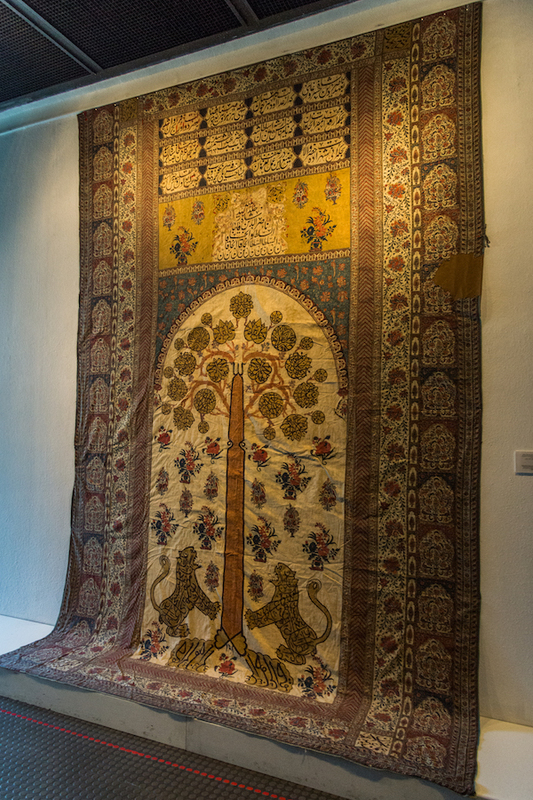 The Qashquai are renowned for their carpet weaving and so, based on Parvis Tanavoli’s drawings and specifications, they produced some beautiful pieces that you can also see in the exhibition. 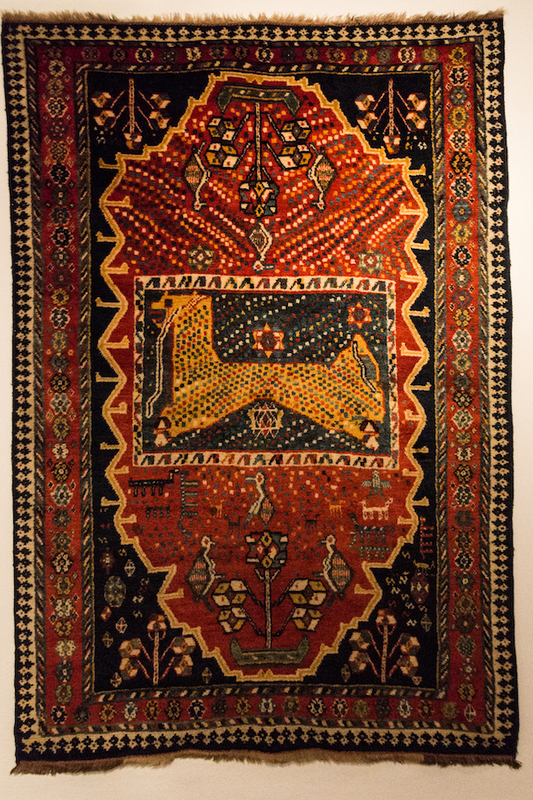 It is almost impossible for a weaver to follow strict instructions since it has a lot to do with his or hers own esthetic and creative taste. 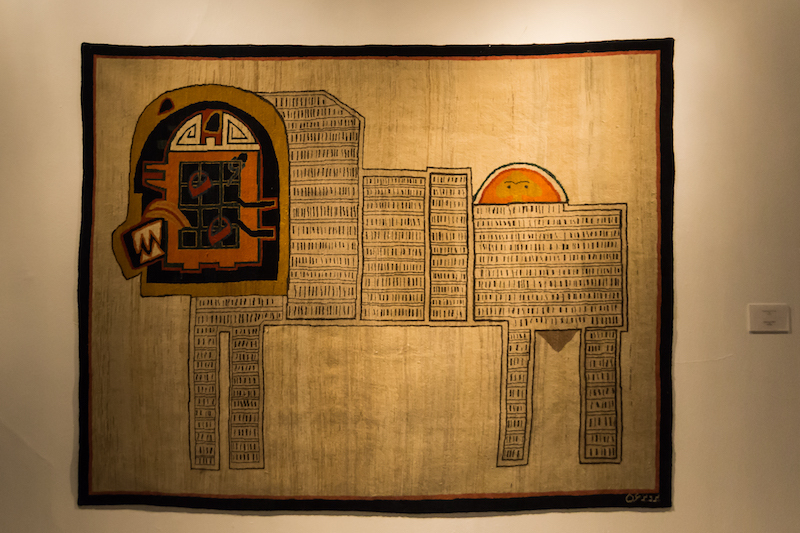 So each rug is then more a creative collaboration based on Tanavoli’s vision. 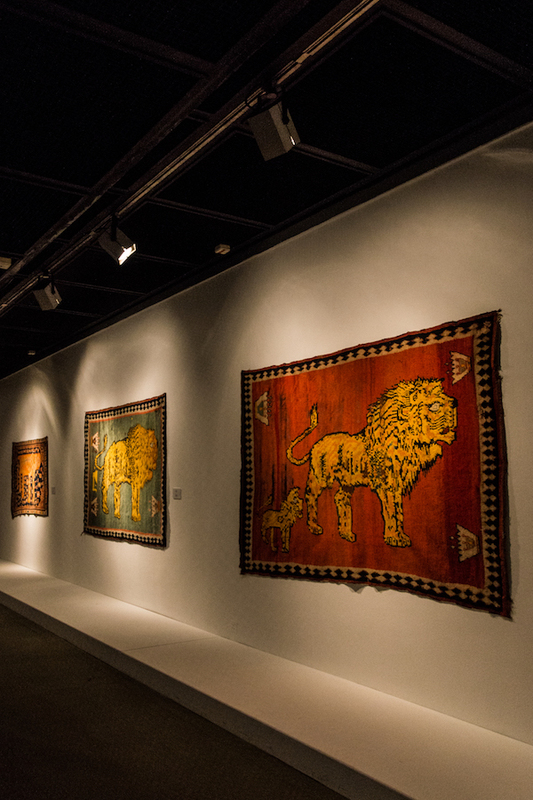 What I’m going to show you now is a few highlights of the exhibition with emphasis on Parvis Tanavoli’s work and his famous lions, but also some ancient artifacts, museum pieces and different art work from his collection. I encourage you to come and see for yourself if you can, as there is so much to discover. Lions have been unfortunately extinct in Iran for some time. The last sighting was in 1942. But the Iranian heritage is forever intertwined with this symbol of bravery. This was without a doubt one of the most special exhibitions I have seen. If you are in Iran in July or August, it will be on until the 29th August. If you can, don’t miss it. 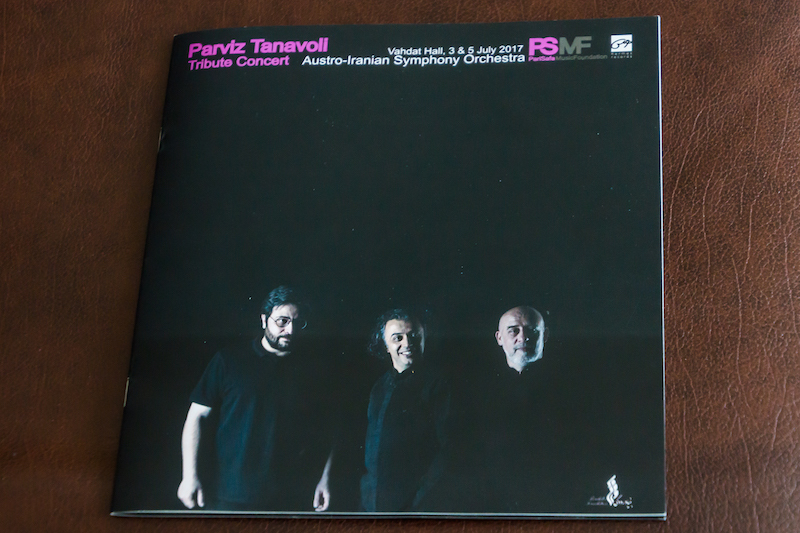 But if you can’t come to Iran in the meantime, then I advise you to visit Parvis Tanavoli collections in a museum near you. And maybe one day this exhibition will be able to be shown abroad. Thank you so much Luisa. He is an amazing artist and I hope one day you get to see more of his creations.